Although one would expect molecules and atoms to be frozen out on dust grain surfaces at the low temperatures present in the Interstellar Medium (ISM), many species have actually been detected in the gas phase by astronomical observations. In this paper we study one way to release species into the gas phase, namely via the process of chemical desorption: evaporation caused by the excess energy of an exothermic reaction. Specific emphasis was put on the quantification of the process, in order for it to be implementable in astrochemical models that predict the molecular abundances in space. 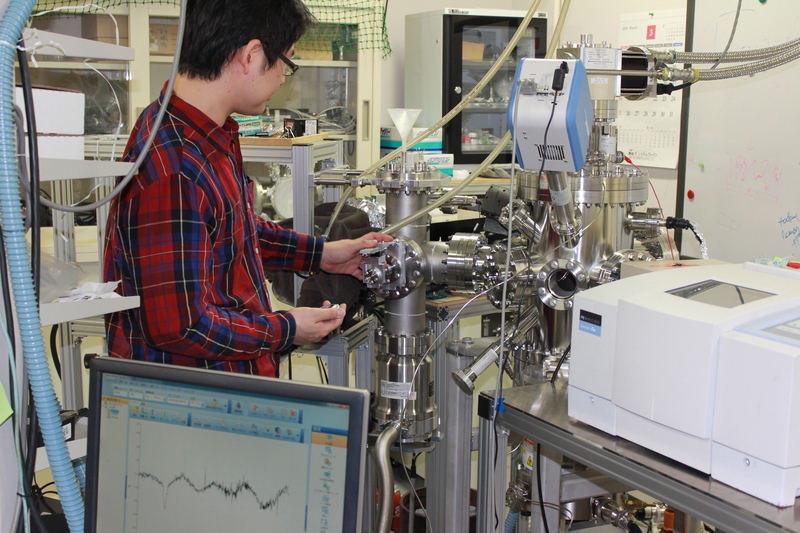 I went to Japan in the fall of 2016 without having a very well-defined plan of which experiments could or should be done to tackle the issue of what we knew was a hot topic in astrochemistry: chemical desorption. This is the process of reaction products evaporating from the surface on which they have formed as a result of the energy that is set free following the reaction. If efficient, it may explain why some species are detected in the gas phase while they are expected to be formed on the surface of icy dust grains. We started off with some test experiments and to out surprise on one evening we were so sure we saw the signal we were looking for that we opened a can of beer in the lab and cheered to the joyful event! It was only the next morning we saw the same signal during the background experiments and realized it must have been a contamination in the detector. Towards the end of my stay we realized we should focus on reactions where the reactant and the product were the same species as this would significantly decrease the problems we were expecting to face in terms of quantification of the results. Luckily a very skillful master student was indeed working on such a reaction system, albeit in an originally different context; the reaction between the hydrogen atom and the hydrogen sulfide molecule. Although several reactions had already been previously studied by a group in Paris, France (in 2013 and 2016) and chemical desorption efficiencies varied between 5 and 80 %, this particular reaction had not been looked at. During 2017 a full set of dedicated experiments was executed in the lab in Japan to ensure that contamination this time was ruled out, along with several other processes, such as sputtering. This turned out to be challenging to say the least. In the summer I went to Sapporo again to contribute to the final stages of the project. In that same year, however, it became clear that two other groups, in Syracuse (USA) and Leiden (The Netherlands) were also working on chemical desorption. We definitely needed to hurry. Because those groups used a different methodology and studied other reactions, luckily our project was not affected. Indeed, as we expected, it is a hot topic. And now, in 2018, four different groups have studied the same process, partially confirming each others results, partially complementing each other. I am excited to see to which discussions, debate, and future research these will lead in the astrochemistry community in the years to come. This Behind the Paper was originally posted in the Nature Research Chemistry Community. Hi Thanja... could you link to some papers from the four different groups working on chemical desorption? It would be interesting to compare/contrast.